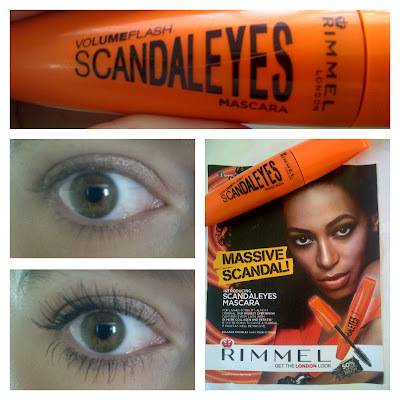 Rimmel's SCANDAL'EYES Mascara / Gee Whiskers! I am a mascara girl - there is no way that I can leave the house without a coating of mascara on my lashes. I'll forgo all other makeup but not my mascara. Needless to say I am always happy to try out new mascara and was recently sent Rimmel's SCANDAL'EYES Mascara to test out and review for the Beauty Bulletin website. The MaxDensity brush, that's 50% larger and thicker, covers your lashes with attention - from corner to corner. Bristles now flex in to deposit mascara and out to comb through clumps, so volume will scream. With scandalous eye opening volume, this mascara should need a license. Watch false lashes become a thing of the past, as Scandal Eyes Mascara becomes the ultimate beauty weapon in your make-up bag. This Rimmel revolution has 3x the collagen for plumper, sculpted lashes, 3x the keratin for strong and healthy lashes and...3x the attitude to guarantee scandalous behaviour! I’ve been using the mascara for almost a week now and thus far I have been incredibly impressed and happy with the results achieved. For once there is a mascara that isn’t promising far more than what it actually delivers. It’s not saying that you will get a false lash look but that with using this mascara you won’t really need to have flash lashes. 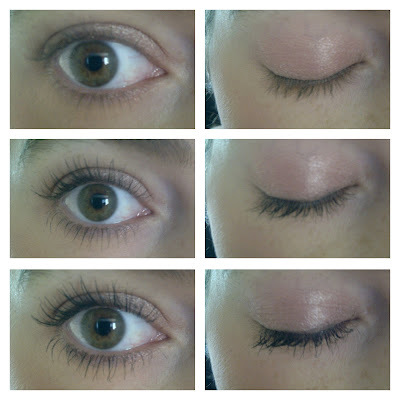 In my opinion, it fulfils that claim – My lashes look great after 2 coats – beautifully lengthened and defined. But if you are after a full, dense look of hundreds of lashes this mascara does not do that. In my opinion I do not think (nor have I come across) any mascara that can take the limited lashes we naturally have and make them look the same as applying false eye lashes. What this mascara does do, is take what you have and make it look remarkably good. The bigger brush means that more of the product is picked up and applied to the lashes and this is what gives each lash a thicker look, creating the appearance of more lashes. The mascara itself is also a thick formula meaning that it gives the lashes a good coating and a person can easily build up more volume with more coats of mascara. There are no serious blatant lies in the advertising campaign - There immediately I am sold on this product. The product’s formula does not give my lashes a hard and brittle feeling. When applied my eyelashes feel soft and smooth. I can feel that there is product on my lashes but it does not weigh heavily on them and it’s hardly noticeable that there is something coating my lashes. The wand takes getting use to (because of its size) but it is phenomenal at it’s job of coating, separating and extending lashes leaving no clumps. I’ve only been using the mascara for just under a week now so I’ll have to wait and see how long lasting this effect will be. My past experience with mascaras has been that about 3 weeks into using a tube the clumping starts as the product begins to age and dry out. I can’t say that I am crazy about the packaging of the mascara. I am not a fan of orange so my opinion is completely biased. I personally like mascara tubes that have a touch of elegance or funkiness to them. I understand that the orange with black is suppose to draw a person’s attention to it on the shelves (I can’t think of any other mascara that has a bright orange tube) but personally I would probably reach for Rimmel’s The Max Volume Flash Mascara because the packaging of that is more funky – bright pink with gold print. The Scandal Eyes Mascara is however cheaper and that’s probably why the packaging is not as expensive looking and feeling as the other Rimmel mascaras. I honestly can’t say that I have any other feelings of dislike or disappointment towards this product. At only R89.95 this is an affordable mascara that delivers great results! Post Update: I created a video review for the Beauty Bulletin website. If you'd like to view my video you can view it there.